Much of the time, lures are designed with a specific application in mind. But sometimes we discover that some baits are multi-purpose. I was reminded of that on a recent fishing trip. 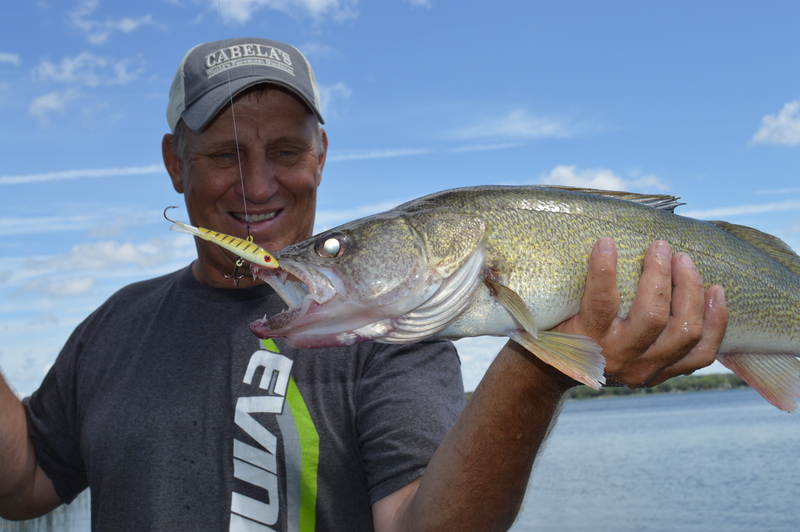 I was sharing a boat with fishing friend Mike Frisch in central Minnesota and walleyes were our target. Mike had been catchin’em good on Puppet Minnows. Puppet Minnows were originally designed to be dropped through a hole in the ice, but for the past few years we’ve been using them for open water walleyes. Six or seven years ago another fishing friend Joe Honer and I used them in South Dakota in September to catch walleyes. What Mike and I did on our recent trip was confirmation again that some lures designed for ice-fishing can be productive in open water. We were using spinning tackle with braided line that was fourteen pound test, which means it had about six pound diameter. We tied in a length of eight pound test fluorocarbon line about twenty inches long. We attached the fluoro to the braid with a small swivel. The swivel prevents line-twists. The braid provided outstanding sensitivity and hooksetting power, and the fluorocarbon made the line connection to the bait invisible. We tied a 9/16th ounce, three inch Puppet Minnow directly to the line, although I like to use a snap to attach the bait also. Lure color wasn’t critical. We were fishing deep water structure. The humps that were most productive topped out at about seventeen feet and were surrounded by water thirty feet deep. We got on the water about five in the afternoon, and our sonar revealed walleyes tight to the bottom on the deep edge of the hump. Mike said we would “probably catch a few in the deep water, but the best bite would come when the fish moved shallower and the sun was just above the tree line”. Mike was right. To fish the Puppet Minnow, we dropped it directly over the side of the boat and let it fall to the bottom on a tight line. If we were fishing thirty feet of water, we had thirty feet of line out, maybe thirty one. We were lifting and dropping the bait. Sometimes we’d rip it up pretty aggressively, other times we used a softer lift. We let the bait fall back to the bottom on a tight line. One of the keys was where our rod tip was. We let out enough line so that when the bait was on the bottom, our rod tip was at about the seven o’clock position. When the bait fell back to the bottom, the line went slack when the rod tip was at seven o’clock. If the line didn’t go slack, that meant we were in deeper water and had to let more line out. If the line went slack at nine o’clock we had moved shallower or a fish had eaten the bait. We saw a good number of walleyes on the sonar, and we caught a few, but the bite got much better when we saw the fish move a couple of feet off the bottom. The Raymarine Dragonfly unit that we were using did an outstanding job of revealing the fish, and it’s a great value. We caught a good number of walleyes that evening on the water, and they were all good-sized, seventeen to twenty three inches. And we were reminded that just because a bait was designed for one thing doesn’t mean it’s only good for one thing. Keep an open mind when fishing and you’ll catch more fish. To see all the most recent episodes of the Fishing the Midwest television series, new fishing related tips, and fishing articles from the past, go to fishingthemidwest.com. If you do Facebook, check us out for a variety of fishing related things.